Today, we begin to celebrate the 2018 National School Counseling Week as a way to recognize and honor the influence, guidance and inspiration that counselors provide to students across the country. I had the opportunity last Friday to participate in the 2018 School Counselor of the Year program in Washington, D.C. The event helped reaffirm that the work we do in the education field, at whatever level we might participate—school, district, state or national—is ultimately supported by people on the ground who have a passion to change lives. As the American School Counselor’s Association celebrated the nation’s top school counselors, the Council of Chief State School Officers brought the State Teachers of the Year together for their annual induction meeting in California. It’s truly exciting to see, across the nation, that educators on the front lines are being recognized and honored for the work they do each and every day to support America’s students. We at ACT want to offer our congratulations to these professionals for their dedication and service to our nation’s students. We admire and support the work done by these amazing educators and the millions of others around the country just like them. They are the true American heroes of education. 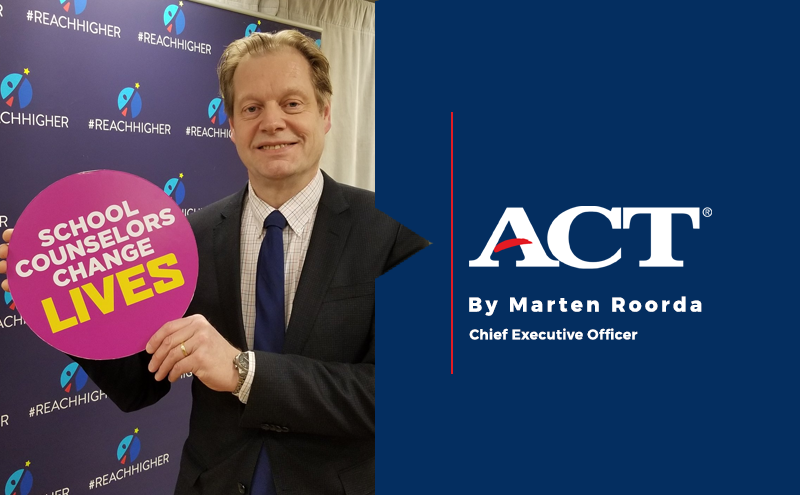 On behalf of ACT and our staff across the country and around the globe, let me say a heartfelt thank you to the teachers, paraprofessionals, counselors, principals, superintendents and everyone else involved in educating America’s future. We are a better and a stronger nation because of your efforts, and we stand ready to support you in your service to our nation’s students.